Every graphics professional worth his or her salt knows the importance of color management. No matter how much thought artist and client put into the color scheme for a given project, all of that work is for naught if you can't get your results to match your expectations. Enter Real World Color Management. 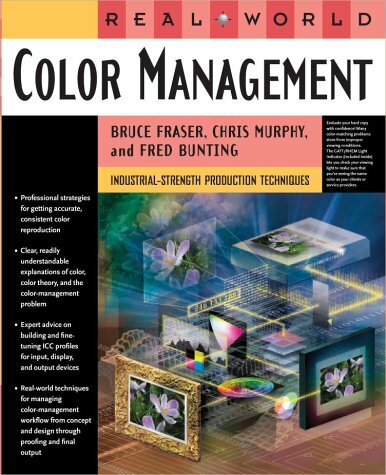 In this industrial-strength, under-the-hood reference, authors Bruce Fraser, Fred Bunting, and Chris Murphy draw on their years of professional experience to show you everything you need to know about color management. Whether your final destination is print, Web, or film, Real World Color Management takes the mystery out of color management, covering everything from color theory and color models to understanding how devices interpret and display color. You?ll find expert advice for building and fine-tuning color profiles for input and output devices (digital cameras and scanners, displays, printers, and more), selecting the right color management workflow, and managing color within and across major design applications. Get Real World Color Management--and get ready to dazzle! Bruce Fraser is an internationally known author, consultant, and speaker on the topics of digital imaging and color reproduction. He is the co-author of Real World Adobe Photoshop 7. Fred Bunting is a writer, illustrator, and speaker on the topics of color theory, color management, and digital imaging, and is the author of the acclaimed Colortron color primer. Chris Murphy is president of Color Remedies, specializing in worldwide training and consulting in emerging color technologies.